It's always nice to mix up your style or try things that take you a little outside of your comfort zone. 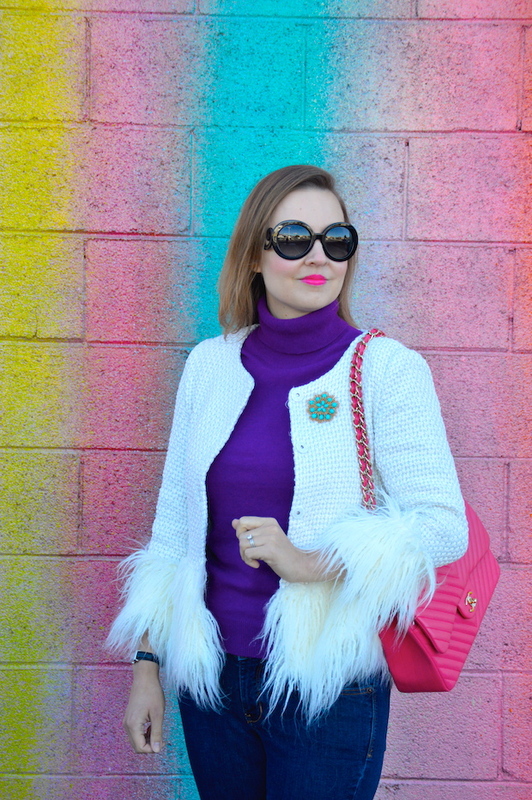 This fur trimmed tweed coat from SheIn definitely fits into this category! The tweed element of the jacket makes the piece lady-like and classic but the fur is definitely very glam and maybe even a little "rock n' roll. Since this jacket is under $40, it definitely makes for an affordable way to spice up your wardrobe! 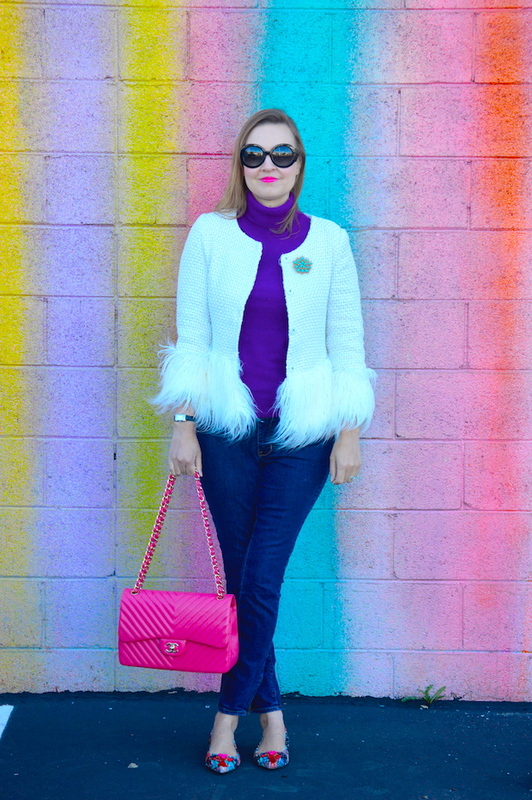 Just like I did last week in my post "So Chanel, Yet So Not Chanel", I mixed up my furry tweed jacket with some classic pieces for a polished look. This includes my brand new Chanel bag, which I am currently babying because I am absolutely paranoid about it getting creased, spilled on, or stained by rubbing on my jeans. Also, to go with the tweed in the jacket, I am wearing a pair of embellished tweed shoes from J. Crew. Last, but not least, I almost forgot to mention the addition of the pin. The pin is vintage (I found it on eBay) and I like to think that it really ties the outfit together! On second thought, maybe it's the wall that really ties the outfit together? It does, after all, contain every pastel color in the rainbow! The fur trim is so fun! Love that bag too! What a fun jacket! I love the mix of classic and quirky. 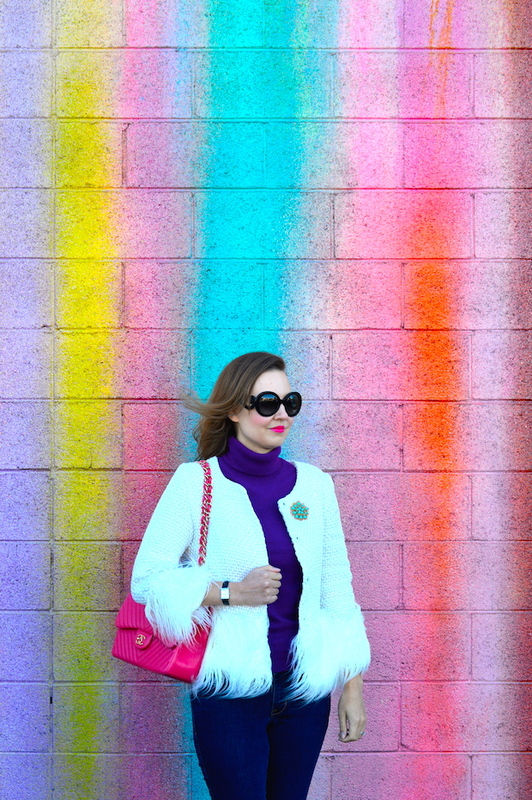 Thanks so much for linking up with Fabulous Friday! I am loving that pink purse! So classy and chic! 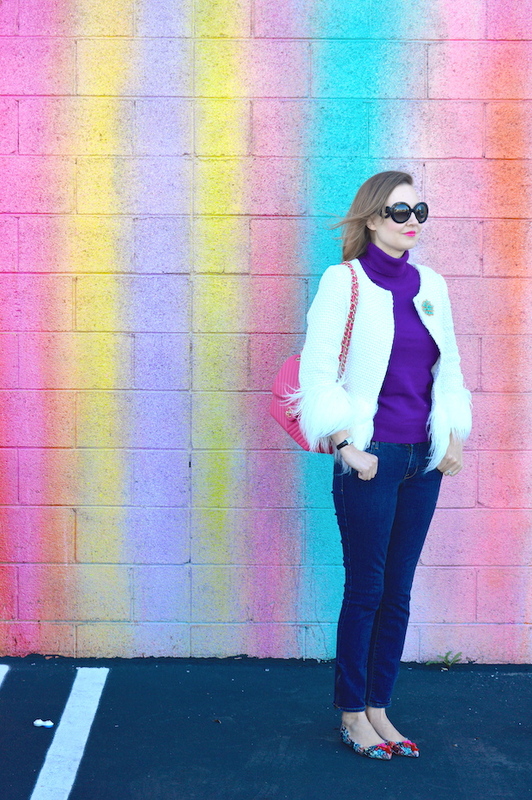 The jacket is such a fun piece and I love the whimsy it has!